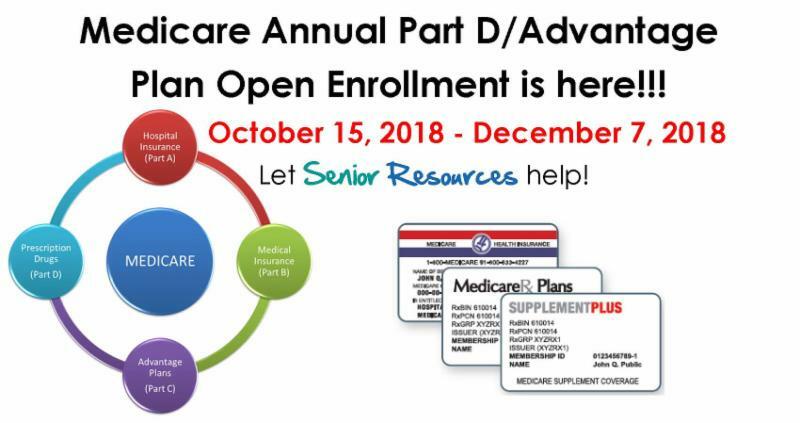 The time for Medicare Annual Part D and Advantage Plan open enrollment for next year has arrived! Open enrollment for these two health insurance programs started October 15, and will close on December 7, 2018. Choosing the right insurance policy and navigating the process can be confusing and difficult, especially when it comes to picking the best policy for you and your family. Throughout November and December, Senior Resources will hold several enrollment events and presentations throughout their coverage area to assist you in making the right choice. Enroll in a 2019 Part D plan or a Medicare Advantage Plan. Appointments are REQUIRED. Please call 860-638-4540 to schedule your appointment. November 5, 2018 - Medicare Savings Program Review - Beckish Senior Center @ 12 P.M.
November 5, 2018 - Medicare Basics and Enrollment Overview - Portland Library @ 6 P.M.
Enroll in a 2019 Part D plan or Medicare Advantage Plan. Appointments are REQUIRED. Please call 860-447-5232 to schedule your appointment. Appointments are REQUIRED. Please call 860-537-3911 to schedule your appointment. Appointments are REQUIRED. Please call 860-873-5034 to schedule your appointment. Appointments are REQUIRED. Please call 860-456-6785 to schedule your appointment. December 6, 2018 - Medicare Savings Program Review - Quinnebaug Valley Senior Citizens Center @ 10:15 A.M.
You can find out more information by calling Senior Resources at 860-887-3561 ext. 132 or by emailing seniorinfo@seniorresourcesec.org. You may also call me at the Capitol at 860-240-1373 or email me at susan.johnson@cga.ct.gov.